So, working hard takes its toll on my stomach. I get so h(a)ngry by the end of the day that I start craving all sorts of food. Tonight, I just wanted something to soothe my tired soul. And what better way to do that than with a nice hot bowl of soup. But nothing too heavy in this! It has to be light and heavy at the same time (d’ya get what I mean?) Well, tom yum is the answer. I got the recipe from this website and boy, oh boy, it was as authentic as you can get. Taste test, you may need to add more lime juice or fish sauce as the milk and roasted chili sauce throws off the sourness and saltiness. Then I like to start by squeezing my limes. 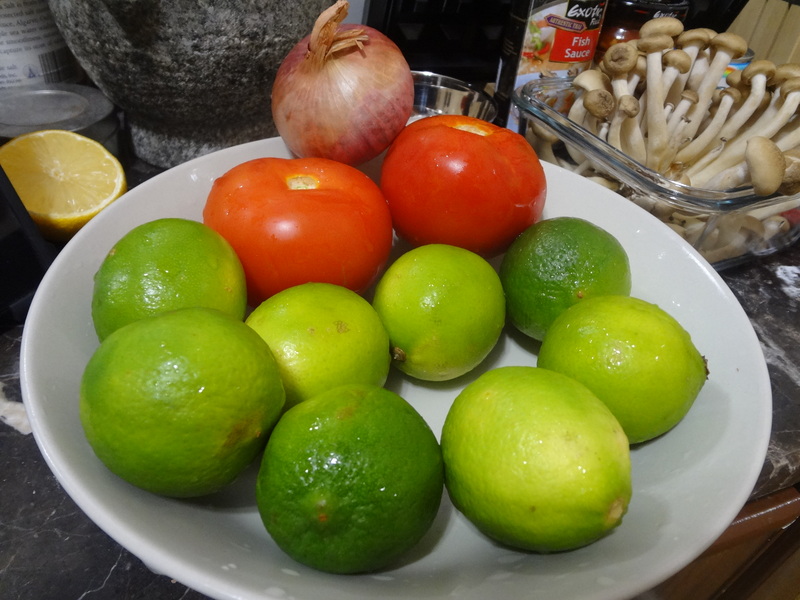 This is not the first step of the recipe, but it’s best to have your limes squeezed so when you need them later, you don’t need to rush to squeeze them all. Slice about 10 limes and juice them all into a small bowl, and set them aside for later. Take your stalks of lemongrass, and first tear off the outermost leaf and throw it out. Then, I like to use a mallet to lightly pound the lemongrass to release the flavors. Then just slice it diagonally into 1 inch strips or so. Take about 1 thumb sized chunk of the root part of galangal, and chop it into slices. Coarsely break about 10 kaffir lime leaves – no need to cut them, just tear them – which is going to help release their flavor. I used about 10 Thai bird chilies (prik kee noo) for this recipe, but you can use however many you’d like. First, take off the stem, and then you can either just slice them in two pieces, or give them a little pound on your cutting board like I did (just be careful of flying seeds). You can also remove the seeds if you’d still like the chili flavor but not as much heat. Now prepare your shrimp (or whatever meat of choice you’re making tom yum with). Since I used goong mae nam (กุ้งแม่น้ำ), freshwater shrimp, I first chopped off all the tentacles. Take two roma tomatoes and two small white onions and slice them into wedges – you want them to be big and chunky. Then go ahead and add them to the tom yum. If you’re using shrimp for this tom yum recipe, you might get some foam build up on top of your soup, in which case you can just lightly skim it off the top and toss it out. 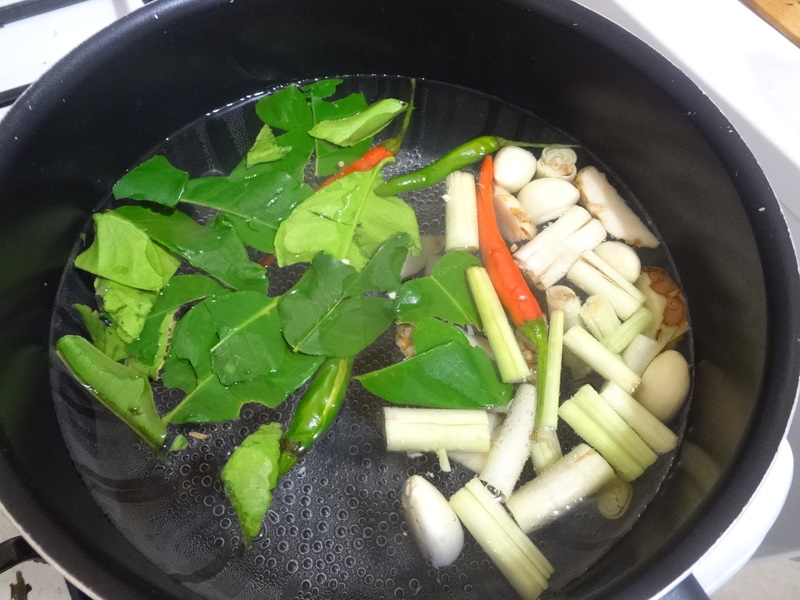 Boil the tom yum for about 2 – 3 minutes. Next, add about 6 tablespoons of fish sauce first, and 2 teaspoons of sugar. You may need more of each, but start with that. \Boil your tom yum for another minute or so and then turn off the heat. You don’t want your tom yum to be overcooked. The mushrooms and onions should be soft, and then it’s ready. Once your heat is off, go back to your lime juice and add about 8 tablespoons of lime juice (depending on how sour you like it, I like it really sour). Make sure you taste test until your tom yum is perfectly sour and salty. You might need to add more fish sauce, sugar, or lime juice. You now have Tom yum goong nam sai (ต้มยำกุ้งน้ำใส), the clear version of tom yum. For this recipe, I took out about ½ of the tom yum and set it aside as the clear version, and then made the other ½ as the creamy version. Turn your heat back on low. Add about 3 heaping tablespoons of Thai roasted chili sauce (nam prik pao น้ำพริกเผา) to your soup and stir it in. Also about 10 tablespoons of evaporated milk. Mix it all in and let your soup heat up for about 1 minute. At this stage, you’ll need to taste test and evaluate. The roasted chili sauce and creaminess from the evaporated milk will alter the flavors from the clear version, so you might need more lime juice and more fish sauce. Just keep taste testing until it’s exactly how you like it. And there you have the creamy version of tom yum. 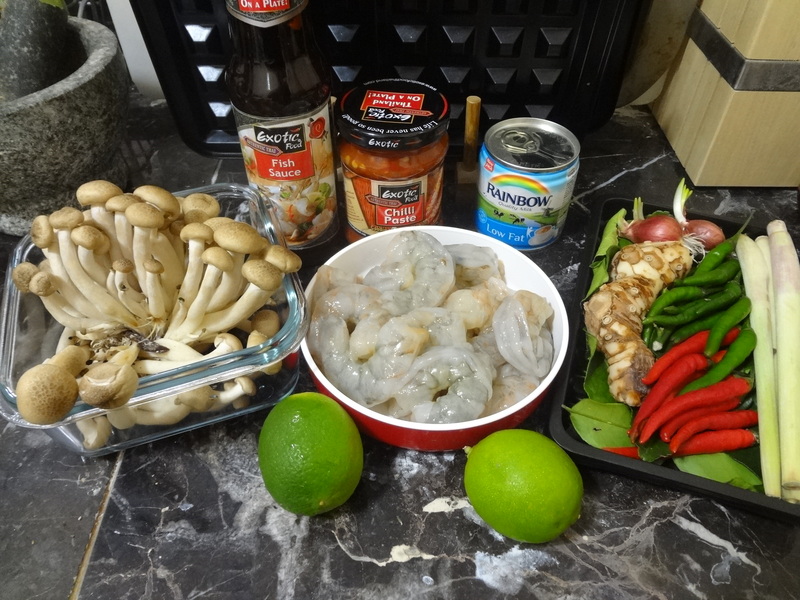 Note: I got the fresh tom yum “kit” ingredients from the cold section of veggies from Carrefour Villagio same for the fish sauce and chili paste, but I’ve also seen them in Geant, Megamart and Lulu. Your Tom Yum looks absolutely YUMMY. Next PostRandom Stuff: I’d rather cook for a whole day than fold a basket of clothes.